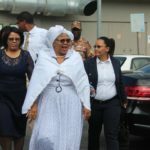 WHILE testifying in her own defence today, Education Minister Katrina Hanse-Himarwa denied outright that she gave a directive to remove names from a housing beneficiary list and supplementing those names with those of her relatives. Hanse-Himarwa, who was Hardap Region governor at the time, testified that she as the governor, she did not have the power to allocate houses to beneficiaries. She further denied any knowledge of the political affiliation of the persons whose names were removed from the beneficiary list. Hanse-Himarwa further denied knowing one Justine Gowases at the time the list was given to her. The minister testified that she only later discovered that the woman is a distant family member but stated that she does not closely associate with Gowases. She was at pains to admit that the second person added to the list is indeed married to her younger brother. Hanse-Himarwa testified that she suspected nothing until Paul Nghiwilepo, Mariental Town council Chief Executive Officer, called and informed her right after he was interviewed by the Anti-Corruption Commission (ACC). During the conversation, Nghiwilep allegedly told her that investigators pressurised him into saying that she was the one who unilaterally removed the two names from the beneficiary list. Hanse-Himarwa testified that during the meeting, Regional Councillor Edward Wambo said that there is a need for houses for staff members at the Office of the Governor. According to the accused person, Wambo allegedly pointed out that the persons in need of houses were her private secretary and personal assistant. She further testified that the Mayor during the meeting also expressed disappointment that his staff were not made part of the selection process. “I advised that the Mayor sort out the issues at the municipality and immediately dismissed the pleas of Wambo because I did not want people close to me being listed as beneficiaries. I never had the right nor the power to direct anyone to remove or add names. That was not the purpose of the meeting. It was not a resolution meeting but a courtesy meeting,” she testified. In her evidence in chief, Hanse-Himarwa also denied that she spoke in an intimidating voice to the special advisor to the Minister, as was previously testified by state witnesses. Deputy Prosecutor-General, Ed Marondedze, took the accused person under cross examination shortly before the court proceedings were postponed for lunch.